Hello Kitty Hell won’t like this. Miss Kitty’s quest into mainstream gadgetry continues with this Medion limited edition Hello Kitty mini notebook – the S1211. And for a change, it’s available in the UK as opposed to Japan only, with no word of a European release. So for those of you who have shed a tear each time you make the realisation that having your very own HK laptop is a very long plane journey away, your time has come. It’s a 10-incher (so shouldn’t it be a netbook then? ), with a 1.6GHz N270 Intel Atom processor, 160GB HDD, 1GB RAM, webcam, and runs Windows XP Home Edition. It’s available in black or white complete with Hello Kitty’s big head adorning the cover. Guess who&apos;s more interested in her Blackberry than her boyfriend? 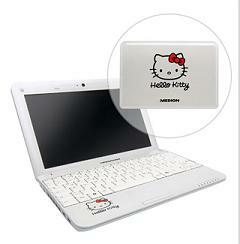 hi, where i can buy this Hello Kitty mini notebook?please…please…please… let me know….. Okay, I like HK Hell but I confess to like the minx of a cat with no mouth and this is cute and cool!